In many contexts you need to handle user permissions to access, create or change some kind of resources. 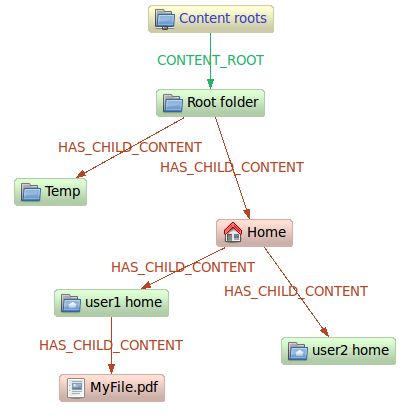 A common example is a file system, and that’s what we are going to dive into in this blog post. We’re going to use Ruby bindings for the Neo4j graph database to create a small – but working – example application. So user permissions, what are they all about? Obviously it’s about users, and usually user groups as well. 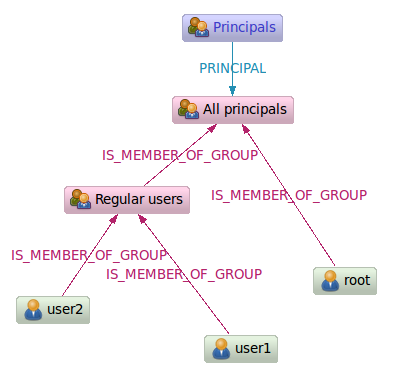 We’ll abstract this away a bit and use the term principals, which can be single users or groups. The other side of user permissions are the resources which are to be protected. In our case we’ll have a file system, so there will be folders and files. Here we’ll use the term content. If the subreference node isn’t found, it will be created and connected to the reference node. As you can see, we’re adding a property with the key name to the nodes as well, which is there solely for the purpose of visualization (the images in this post are created using Neoclipse). If a new principal isn’t member of any groups, it’s added as a top-level principal, connected to the principals subrefererence node. In other case, it’s simply added to the groups. 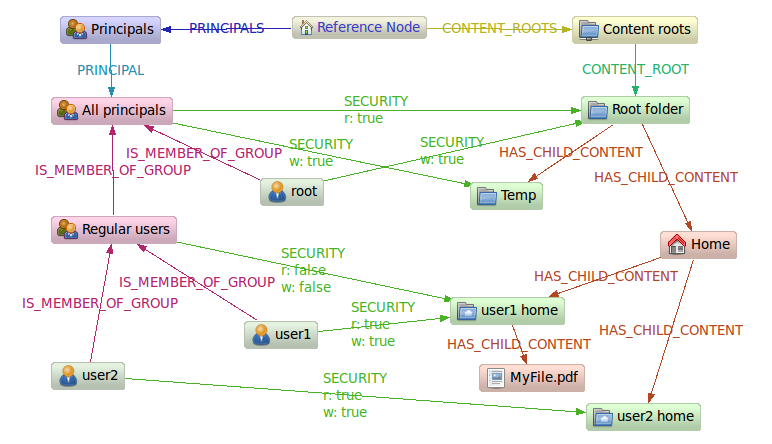 Move from the content node and upwards through the file system structure and investigate each level for permission information. On each level, see if there are any principals related to or identical with the principal concerned. Make sure to use the permission information from the principal closest to the principal concerned. If permission information was found, return it; otherwise, continue traversing to the next level in the file system. Here’s our function to check the distance between principals (and to see if they’re on the same path at all). has_access( content, principal, flag ).to_s + "n"
Thanks for reading – any feedback is welcome! Why do you need the &quot;All Principals&quot; group? — couldn&#39;t the &quot;Principals&quot; sub-reference node serve as the &quot;All Principals&quot; group? In this example maybe it could, but if there&#39;d be other &quot;top level&quot; groups you could more easily see the difference between those two. Is it possible to achieve this traversal using a gremlin query? I&#39;m new to Neo4j, and wondering, Is it possible to do this query traversal using Gremlin? It seems that this is the type of thing that you&#39;d want to give to the server to process instead of making several requests. Thank you Matt for the suggestion!